The Seven is the third in Peter Newman’s “Vagrant” series. I thought the first, “The Vagrant” was a great story, told in an interesting way, and the second was a great piece of fantasy in its own right. That meant that The Seven had some pretty big narrative boots to fill, as it moved the series toward its conclusion. 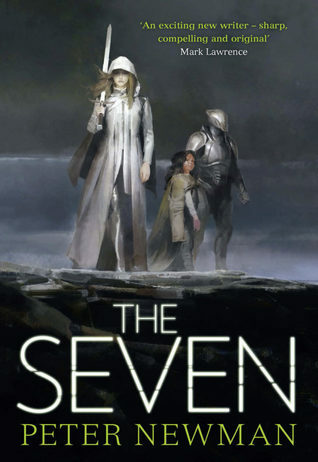 Set years after the end of the previous book, the world of The Seven is equal parts familiar and strange. In the north, the sclerotic empire of the Winged Eye is now resting under the somewhat benevolent hand of Vesper. An idealist, with a penchant for trusting people and making unlikely friends, Vesper is determined to shake things up in the Empire of the Eye. As the Empire is learning to live with the disintegration of its greatest threat, the Breach which spewed otherworldly influences into the more familiar realm, it’s in something of a state of flux. Vesper closed the breach. Vesper has the sword of one of the Seven, the divine leaders of the Empire, most of whom haven’t been seen for years. Newman shows us an Empire terrified of change, one which has been in stasis alongside its leaders, perhaps for too long – and now has no idea how to cope with change. The rituals and habits that have pushed society through millennia are taking a long time to change. Still, Vesper is making a go of it, using her assumed authority. It’s interesting to see the institutions of the Empire slowly drifting apart at the seams, as it copes with no longer having an external threat to define itself against. At the same time, there’s still the issue of the Infernals, those otherworldy essences which arrived in the world before the closure of the Breach. They, and the half-breeds, a fusion of humanity and Infernal essence, are having to redefine themselves as well. Without the Breach as a constant source of reinforcements, they’re having to consider a longer term perspective. The half –breeds have formed communities, and they’re learning to live in the twisted version of land that’s available in the south, over the sea from the Empire of the Eye. This is no longer a world of eternal war, of expansion, defeat and conquest – but a world that exists afterwards, where the survivors have to learn how to live with each other. As one might expect after years of conflict, this is…rather difficult. As with the Eye, the fragmented domains of the Infernals are under pressure to change, to adapt to their new situation. As with the Empire, there’s always the danger that they’ll self-immolate whilst doing so. All parts of this world are beautifully detailed and inventively realised – the straight-backed legions of the eye, led by knights with singing swords are a stark contrast to the Infernals that can inhabit multiple bodies, or graft extra limbs to themselves, or the half-breeds whose brush with Infernals has left them fearsome giants. You can believe in the Eye, its searching, wavering gaze, and in the demons, with their energy and desire to exist, and the half-breeds and their plans to build better lives. They’re all internally consistent, cohesive, and rich with meaning. As the world teeters on the brink between the hope of change and the old certainty of war, none of them are quite prepared for the Seven. The characters – well, there’s a great many old favourites here, but the stars of the show are, I think, Vesper and the Vagrant, along with Vesper’s daughter, Reela. Vesper is a little taller now than she was in The Malice, a leader struggling to work out how to draw people together, to get them to build something new, and put down old grudges. She’s given her own weaknesses – a need, in particular, to do everything she can, a refusal to make time for her own emotional connections in the sea of larger things. As ever, the consequences of these flaws are explored alongside the benefits that they bring; even as Vesper is building a newer, happier world, her own relationships have a sense of fragility about them, the energy that would sustain them pushed out into the world. Watching Vesper, whom we last saw as a child, struggling to speak with her own young daughter, is heartbreaking. She’s away for too long, and disconnected from her own life to the extent that her daughter is, if not afraid of her, then hurt by her, suffering the consequences of her absence. Into that void steps The Vagrant, a father to Vesper and a figure to emulate for Reela (which causes some complex conflicts within the heart of her own father). The Vagrant is older than we may remember, but willing to put on armour and help his daughter change the world. Still silent, and like Vesper, still stubbornly unwilling to accept injustice, he moves through the narrative like a tide of obsidian – obdurate and unstoppable, with a sharp edge. Father and daughter together are a delight – their emotional connection obvious and their conflicts believable and human. Reela is the third of this tripod, and clearly idolises The Vagrant. Her feelings for Vesper are more complex; you can sense the anger at abandonment there in the prose, along with the yearning for acceptance and love that sits alongside it. This is a story about family, amongst other things, and this one – The Vagrant, Vesper and Reela – is under strain. That said, it’s also still clearly a family – occasionally fraught and argumentative, but tied together by bonds of affection nonetheless. Other returning favourites include Samael – a man who became part of an Infernal knight, now struggling to determine who exactly he is, and what he’d like to be. Samael’s discussions with Vesper verge on the philosophical, and his stoic search for a sense of self is deeply compelling reading. In this search he’s matched by the mysterious First, an Infernal that holds its essence across multiple bodies, a distributed consciousness, which struggles to understand humanity and the world in which it exists. Their separate journeys toward understanding are fascinating. Perhaps the characters who loom largest are the titular Seven, and their creator. We get some understanding of the drivers behind the creation of the Seven within flashbacks, watching a woman determined to save the world ruthlessly take the steps she feels are required to do so. The Seven are visible in both timelines – as the end product of the past, the long term wardens of the Empire of the Eye. In the present, they’re somewhat more complex. If the world is not to their liking, they have the capacity to unmake it, and hold in their hands an Empire which regards them as divinities. They’re mythical figures, as the book begins. Each becomes distinguishable from the others though, the stories of their pasts being revealed, and the decisions they make in the face of the present setting them apart from each other. The Seven are the ultimate authority for the older vision of the world, stepping into the new society which Vesper is struggling to construct. Seeing them as individuals, they seem complicated, driven, forbidding - and at least as strange as the Infernals they were meant to oppose. The main strand of the narrative is centred around Vesper’s efforts to create a new world in the aftermath of the old – but there’s a lot going on there. There’s some politics, as disparate factions are dragged together. There’s the social changes going on in the Empire and in the south. There’s some absolutely storming battle scenes, kinetically, gracefully, bloodily and uncompromisingly written. There’s scenes of love and affection to warm the heart, and some betrayals which threaten to break it. This is a story of a world being brought together, and of different visions for the way that world will rebuild. It’s complicated, captivating stuff – but Newman’s liquid prose makes it a great read. Also, and I feel I have to mention this – there’s a goat. Several goats, in fact. If you’re new to Newman’s world, I’d suggest picking up The Vagrant and working forward from there. If, on the other hand, you were left on tenterhooks after The Malice, if you wanted to know what happened next, if you’ve wondered about The Seven, and the fates of Vesper, the Vagrant and their goats – then you owe it to yourself to pick up this absolutely excellent conclusion to the series.